Discovering the original meaning of any passage can be challenging. And because a passage's original meaning isn't always apparent, we can't simply rely on our intuitions to find it. Instead, determining original meaning takes practice and a certain level of skill. So, how can we develop the skills we need to understand the original meaning of biblical passages? In our growth as Christians, one of the things that we want to be sure that we're constantly doing is growing in our ability to interpret and understand Scripture accurately. To the degree that we understand it better, to that same degree our Christian walk will be shaped in ways that it should. And there are a variety of ways that this can take place. Some of them on the more scholarly level, but here's where I would start for every Christian: Find a gospel-preaching, Bible-believing local church where you can sit under the discipleship of godly pastors who will not only preach to you the Scriptures on a weekly basis, but in their preaching model for you how to understand, how to interpret Scriptures. And just in the process of being involved in that kind of fellowship with that kind of gifted teaching, we're unavoidably going to absorb good habits about reading the Scriptures and interpreting them … So, one of the things that would additionally be helpful would be to learn to read the Scriptures on a broad level and a narrow level. And when I say read the Scriptures for their breadth, I mean maybe something like a "read the Bible in a year" plan where, in the course of a year, you get the full scope of the Bible's teaching. And as you have the full scope of the Bible's teaching, that's going to help you understand individual passages… So we don't only want breadth, but we also want to learn habits of good Bible study for individual books of the Bible where we go down a little bit deeper than you might in your four chapters a day reading in your annual Bible reading plan. But having that depth now is going to help us when we come around to read the Scriptures again next year and we get back to that passage. We're bringing more information about its context, both historically and grammatically to understanding those materials. And at a more academic level, someone who's involved in seminary or some advanced discipleship courses, you could certainly learn biblical languages. That would be helpful. The basic ability to recognize and interpret different forms of genre that are in the Bible are basic principles that are helpful for good Bible interpretation. So we know, for example, on the one hand, that a poem is to be interpreted differently than an epistle, and we bring different expectations to poetry than to epistles. Those would be some things that I think would be helpful, particularly in the early portion for beginners to get involved in a local church and have their reading of Scripture shaped and informed by very positive examples from the pulpit on a weekly basis. It's so important to try and find the original meaning of Scripture. And we can sometimes be put off, perhaps, by a translation which gives us an impression that the original meaning was this but we've slightly misunderstood the translation. And so, there's a real value, if it's at all possible, if you're working in a language where there is another translation of the Bible — more than one — then you could actually compare. And so you can see, well, this is perhaps a more literal translation of the original. This one is translated in a way which tries to apply it to our own culture, but in so doing it has slightly shifted what the original meant and I need to get back to find out what the original was. Sometimes using a different translation will actually help. Let me just give you an example. I love the verse in Psalm 23 which says that truth and mercy, goodness and mercy will follow me all the days of my life. And I've been wondering recently if that could possibly mean that when I go through life, goodness and mercy will be what I leave behind. I will follow and leave in my wake behind me goodness and mercy. And it's a lovely idea that perhaps when I go on from a place I will leave behind goodness and mercy. But I've learnt recently that's a complete misunderstanding of what the original Hebrew means. Actually the word "follow" there means God will pursue us. He will actively chase us. Goodness and mercy will find us out, will pursue us all the days of our lives. And so my interpretation was entirely wrong. It was a nice meaning, it made me feel good, but it wasn't actually what the Hebrew was meaning, and I needed to actually have a bit of word study there to find out what the Hebrew word really meant, and I discovered I had misunderstood the word "follow." It actually means to "pursue," actively to pursue. And this is one example of how knowing individual words of the Bible in their original meaning can just help us to keep on track. The Bible, of course, is full of many, many different passages, some of which are very easy to understand, some of which are very complicated to understand. And God has given to the church the gift of teachers to help us understand many portions of Scripture. And many of those teachers have written down things in books we call commentaries or Bible dictionaries. And when available, those can be a great help for us to develop our own skills and learning how to read the Bible well. But if those things aren't available, and even if they are available, there's something more important that any believer can do in reading Scripture, and that is, first, to pray that God would illumine him and to read with a posture of reception toward God. Read with a desire to hear from God … And secondly, after praying for God to reveal, just to read actively, to be an active reader who pays close attention to the text, reads it again and again and seeks to just observe things. Write down questions, or think of questions to ask the text so that you can be engaging it at a very personal level. Those skills will open up the texts of Scripture and help you receive it as a word from God and apply it to your personal life. One way we can discover the original meaning of a passage is by looking at how the author used particular words and phrases in their historical setting. To do this, many scholars today promote a healthy understanding of the Bible's original languages. This often involves the use of dictionaries. So, what is the proper way to use Greek and Hebrew dictionaries when we interpret the Bible? Greek and Hebrew dictionaries are an aid to our own study. They do not supplant our study. So if you're looking up a word, what does it mean in the original language? It's vital to recognize that almost every word has multiple meanings except for technical terms. Almost every word you read in the New Testament or Old Testament has at least two meanings that are possible, two shades of meaning. And the best way to find out which meaning is in your text is by reading your text carefully. In other words, the context will drive you toward the proper definition. Now, that doesn't mean the dictionaries can't help you. They can help you nuance, they can help you go deeper in understanding what a word may mean. Or you may be totally ignorant of it and you have to start from there. But they're not a magic answer. You don't go to a dictionary and say, "This is the meaning of this word." You've got to put it in its contextual speech. It's contextual. We get into problems when we miss that, or when we say, "Oh, the word 'save' can mean 'rescue from hell and damnation' or it can mean 'to preserve something,'" and then when we try to pour both meanings into a passage. The term for that is "illegitimate totality transfer." That is to say, to take all the possible meanings of a word and say they're all in this use. It's very rarely the case that we do that. In the English language, for example, I'm sitting in a chair. A chair is an object where you sit in it; it holds our weight and so forth. But "chair" can also be a verb. It can mean to chair a meeting or committee meeting, to be in charge. Well, when I say I'm sitting on a chair, I don't mean I'm sitting on being in charge. We don't want to pour both meanings into one use. We say, "Is this a literal use of this physical object that keeps us off the ground, or is this the metaphorical use of being in charge of something?" You don't try to pour all possible definitions into any one use of a word. If you do, if you do try to make that, you will make mistakes. We should always consider many different questions when we begin to interpret Scripture. This will help guard us against seeing a meaning in the passage that the author didn't intend. One of these questions concerns the literary genre of the book or passage we're studying. But, why is it important to identify the genre of a biblical book? When we approach any book of the Bible, or any passage of Scripture, it's very important to think about genre. Genre is, it's the style, the form, the type of literature that you're talking about … As we think about the different genres of the Bible, we've got law in the Pentateuch — the early books. We've got poetry. We've got psalms. We've got historical narrative. We've got wisdom literature. We've got proverbs. We've got gospels. We've got epistles. Then we have apocalyptic literature towards the end in the book of Revelation. And actually, we actually have some apocalyptic literature in the Old Testament as well. But each of these different genres need to have different unique characteristics that are true for them, that, as we understand these genres, it will help us to have a better understanding of the text itself. One of the biggest things to be thinking about is, is the language figurative or poetic? "Figurative or literal" may be a better way to think about it. I know a lot of people will say, "I take Scripture seriously. I take Scripture literally." And while I appreciate the enthusiasm for taking Scripture seriously — and I think that's a high value for myself as well — but figurative texts are not meant to be taken literally, and literal texts are not meant to be taken figuratively. An example that one of my colleagues here, Todd Mangum, uses is… chapters 2, 3, 4 of John's gospel. When Jesus is speaking about the temple, he says, "Destroy this temple," in John 2. He is speaking about the temple of his body, but his audience understands him to be speaking of the actual temple. They understand Jesus speaking literally there, and they misinterpret it. They don't understand Jesus. In John 3, Jesus speaks to Nicodemus, and he says, "You must be born again." Well, Nicodemus is really confused. Nicodemus does not understand Jesus' genre. Jesus is speaking figuratively there. Nicodemus says, "How can I enter back into my mother's womb?" A classic example of trying to understand what Jesus is saying literally when that doesn't make sense. In John 4, Jesus is speaking to the woman at the well, the Samaritan women, and he says, "I will give you living water." And this woman is confused. "Living water? What are you talking about? You don't have a bucket; the well is deep." It doesn't make sense to her. In each of these examples, the person, the audience, is interpreting Jesus literally when he is speaking figuratively. So that's, I think, a classic example of what we're talking about … Poetic books often speak in figures. Historical books like Kings — that's where I spend a lot of my time doing my research — are giving you a lot of very historical information: this king reigned for this many years; this king came to the throne when this other king was reigning. They mention other people from Nebuchadnezzar, the Babylonian king. Or Tiglath-Pileser, the Assyrian king, shows up. Kings is a historical book, and we can understand it historically. I mean, that's one of the primary interests of Kings. So in each case, we need to be thinking, what is the genre of this text? And as we think about that, that's going to help us understand that text better. It's very important… to understand, among other things, the genres of literature that we have before us. God, in his wonderful work of condescension, speaks our languages. He speaks Aramaic, Hebrew and Greek — the language of the original audiences for these texts — and comes and enters into the languages of human beings. But more than that, he enters in and speaks his truth through the literary genres that are also part of human communication. The Word becomes incarnate in words, and in images, and in language forms and structures. It's a very penetrating incarnational act, this speaking — "lisping," as Calvin says, to our baby-talk ears. And so, it's very important that we understand the words aright, but it's also equally important that we understand the genres correctly, or we will misunderstand. When something is presented in hyperbole, we should recognize it as hyperbole. This is not God deceiving us. This is God speaking through a legitimate form of discourse. Sometimes he speaks history. Sometimes he speaks poetry. Sometimes he speaks command. And occasionally he'll use metaphors, sometimes literal description. And sometimes, as we find in the book of Revelation, he utilizes the genre of apocalyptic communication — a way of speaking characterized by vivid, symbolic imagery and used to present cataclysmic events. The first century audience was very familiar with this, knew how to interpret it correctly, probably no problem for them. But we have to take a few extra steps of effort to enter into their thought-world, and read it in such a way that we understand the image they understood much more easily than we do today. It's important to really understand what kind of biblical book we're reading because there are different types of literature. We've got poetry and law and narrative and that sort of thing. The importance of it is so we have the proper expectations and know how to respond to what we're reading. So, if we're reading a narrative, we shouldn't be thinking, "Oh, I need to obey this and do everything that happened to these people." We need to be observing the narrative and learning from it, what is God revealing to us in it? But if we're reading an epistle, one of the letters, often cases, there's going to be command there, and we need to respond by obeying. Now, by extension, if we're reading apocalyptic, there are going to be symbolic depictions. And we need to try to hold off sometimes trying to imagine what it would look like or what it would be like, and instead try to interpret, what is the reality that these symbols are conveying? Listen to that part. So, genre identification all has to do with making sure we're understanding things the way they were intended to be understood and not responding in a way that's not appropriate to the genre. Before the Reformation, many biblical scholars believed that each passage of Scripture contained four distinct meanings: the literal, the allegorical, the tropological, and the anagogical. This approach to Scripture was commonly known as the Quadriga. But Reformers approached biblical interpretation differently. How did the Reformers' approach to interpretation differ froma the Quadriga? One of the cries of the Reformation was the Latin phrase, "ad fonts," which meant "to the sources." And that was a wonderful thing at the Reformation, that they were no longer wanting to just read centuries of accretions and discussions of what the Scripture meant — "this person says this," almost a rabbinical, "Rabbi so-and-so says… Rabbi so-and-so says…" or "this teacher says… this teacher says…" — but, what does the Scripture actually say? And going back, then, to the original Greek and the Hebrew. And as a result of that, the long tradition of seeing four levels of meaning — the… literal-historical meaning, allegorical meaning, the moral meaning, the "heavenly" or eschatological meaning — there was a lot of critique and criticism of that in a good way in saying, hey, much of this has deviated from the true sense, the true author's intended sense. An example of this would be the well-known parable of the Good Samaritan. From post-New Testament time all the way up to the 1500s, every person who interpreted the parable of the Good Samaritan allegorized it and said, "Well, you know, the good Samaritan is Christ, and the beast represents his body. The inn is the church," and, you know, "the two denarii is the knowledge of the Father and the Son," and all of these allegorized interpretations. But if you look at the actual passage… someone just doesn't say, "Could you please give us an allegorical interpretation of salvation?" But they say, the person asks him, "Who is my neighbor?" And then Jesus tells this parable to show that we have a tendency to excuse our obligation to love the other by saying, "this person is my neighbor and this person is not." And then he ends the parable by saying, "Who proved to be a neighbor?" This is a parable about loving other people and who's a neighbor. Not an allegorical story about salvation. And Calvin really latched onto that and criticized the way that that parable had been interpreted for the last 1,400 years. At the same time, in the Reformation, several Reformers made these pronouncements, but then they erred in interpretation. Luther is well known for having railed against allegorization and then engaged in it himself. Augustine laid out all these sound principles for Scripture interpretation a thousand years earlier, and he also deviated from that. So, that's a warning to us, too. That even as we feel like now we have the right answers or we can see better because we have this perspective, we can lay out these sound interpretive principles and then violate them ourselves. On the heels of the Italian Renaissance and a real growth in humanities and appreciation for how literature works, reformers like John Calvin really wanted to return to what they called the "sensus literalis" — what's the real sense of what a text is meaning and how it communicates to us? And that really was a challenge to how people were reading the Bible in terms of the medieval Catholic Church and the influence, particularly, of the Greek fathers in this system of understanding called the Quadriga. As we look at a passage like the parable of the Good Samaritan — if you think of the Quadriga — people would read it with a sense that each part of the parable would represent something. Not something real but something sort of ahistorical, a deeper metaphor. So, like the inn where the Samaritan takes the one who has been robbed, it's like the church. It's like where we recover and how the gospel sort of does its work. And what readers like Calvin insisted upon is, wait, how does the text itself invite us to understand it? How can we cooperate with the choices of the author, with the intention of the author? That really, in the context of Jesus' parable, he's talking about a very real threat regarding robbers between Jerusalem and Jericho. He's talking about very real racial relationships between the Samaritans and those who lived in Palestine, and that we're to understand the real sense of the text. Now, the fact that it's a parable is indicating that it's representing something. But not something that's necessarily ahistorical. Jesus takes things from real life, and he illustrates how the kingdom of God is like that. And what's shocking about the parable is how the Samaritan really embodies the law of God and how we're to love our neighbor. Not the sense that the inn represents the church and where the gospel sort of recuperates us. Since many early Christians interpreted the Bible in "spiritual" rather than "literal" ways, is there any benefit to reading their interpretations? Teachers in the early church used a variety of interpretive methods. But many early church leaders and theologians approached Scripture as spiritual allegory and didn't pay as close attention to the literal text of a passage. Since many early Christians interpreted the Bible in "spiritual" rather than "literal" ways, is there any benefit to reading their interpretations? Can we as evangelicals benefit from reading early Christian interpreters who dealt in spiritual interpretation or allegory? I would say, yes, for a couple of reasons. First of all, the tradition of the tradition of spiritual interpretation of course begins with Philo in the first century. And Philo more or less, if you take his principles and kind of put them together, anything goes. But the Christian tradition actually doesn't take Philo uncritically. Origen is actually a very important example of that, because where Philo will say, "Oh no, feel free to deconstruct the grammar in a passage," Origen says, "No. In fact, grammar does matter." And where Philo says, "The historical sense doesn't matter. You know, what matters is the spiritual sense," in fact, Augustine comes along and builds on Origen and says, "No, grammar matters and history matters as well." And so, there is a basic concern for the integrity of the text of Scripture. And I would say, in an implicit way for authorial intent, the difference in how these writers look at Scripture versus how we tend to is, for the early church, the primary author of Scripture was God. And so they don't see Scripture as a playground for fanciful interpretation. They see Scripture as the one voice of God, speaking throughout the Canon. And not just through the Canon. Augustine actually talks about God revealing himself through two books, the book of Scripture and the book of creation. And so, there is a common misconception that what these early allegorists are doing is sort of "well-intentioned" deconstruction. First of all, there is no such thing as well-intentioned deconstruction. Second, there's a fundamental difference in that, where deconstruction and the like has the tendency to be an inward-turn approach to interpretation, a self-centered approach to interpretation that is founded on the conviction that meaning is kind of illusory. The fathers, the allegorists in the early church are the polar opposite of that because their interpretive approach is fundamentally turned outward to God's voice in Scripture and in all of creation. And it's not founded on a dearth of meaning. It's founded on a flood of meaning. God is speaking richly everywhere … First of all, I think we misunderstand what the allegorists in the early church are doing. But secondly, I think they're good for us to read because they are devout readers of Scripture who don't have our cultural blind spots. And we're very good at seeing their blind spots, but we're probably far less humble about letting them put their finger on our blind spots. We need that. I think the early interpreters, even where we differ from them in their methodology, are good for us in that they are iron on iron for us. Observing that Christians in the past have interpreted the Bible spiritually as well as literally, should we pay attention to them? What should we do? Can we benefit from that? I believe we can benefit. We have to remember that every Christian believer is fallible. So it all has to be checked out with the Scripture itself which is infallible. That's true both for so-called "spiritual" interpretations and spiritual meanings and for literal interpretations, right? Because we need to check it out with Scripture. We also need to recognize that the Holy Spirit has indwelled believers throughout the ages. So frequently he's led them into truth. Frequently their ideas have value even if perhaps the idea that they have doesn't come from the passage that they're referring to when they're talking about the idea. Still another thing to bear in mind is — I'm convinced and I believe it's there in the New Testament — that the Old Testament has many types pointing forward to Christ and to the church and to the final salvation which God has brought in Christ. So, the Old Testament has depth-meaning. We're not simply to dismiss somebody who finds a relationship to the New Testament and saying, well, I don't see that in the sort of immediate surface of the text. We're to understand that the Old Testament points forward to the New, but we're to check everything by Scripture itself. A lot of the early fathers of the church, such as Origin and others, interpreted the Bible through what we call the "spiritual" interpretation or sometimes the "allegorical" interpretation of Scripture. And that's caused a lot of people, especially modern evangelicals, to say, "Well, what benefit is there for reading them? They don't do exegesis in a disciplined sort of textual manner the way we do." Well, I think there's great benefit in reading them for three reasons. First of all, when you look at what they're doing with some of the apostolic writings, they're actually engaging them and trying to understand them theologically. Not just textually — what is being said? — but, what is the meaning of it? What does it mean beyond just the bare words of the text? And so, in doing so, many times what they try to do is interpret a passage or a set of passages in light of the larger narrative of Scripture itself. That's not unlike what the apostolic writers did in the New Testament with the Old Testament. So, that sort of example of theological reading of texts is instructive to us. Secondly — there's a good reason for reading them — is that much of what they say, while we might say that's not the exegetical point, often it is exactly on point in some larger meaning of what Christian discipleship is about. And so, so long as we're careful not to confuse their exegesis with the truth that their spiritual method sort of unveils for us, it can be very beneficial to help us see theological meaning or see a deeper spiritual application. And the third reason it's beneficial to read them — I'll break this into two parts — first is, it teaches us how we need to be careful that we don't read our own interpretations spiritually into the Scripture. But also, that way of approaching Scripture can have some real benefit especially for preachers as they deliver for us, sort of, allegories that can capture our imaginations. It might help us think more imaginatively when we are trying to unpack the meaning of an exegetical study that we've done. So, so long as we're careful and we utilize them as examples of how the sanctified imagination can work, there is benefit for reading them. As Evangelicals, we value the literal interpretation of Scripture over what we would call an "allegorical" approach to interpretation. Still, it's important to realize that biblical authors, including the apostle Paul, occasionally used allegory when they approached the Scriptures. How did Paul use allegorical interpretation in his writings? In Galatians 4 we definitely see Paul using what we could call allegory. Simply put, saying one thing equals something else. In this, Paul is not unique either in the history of interpretation — or "ancient practice" — or in Jesus' teachings himself. We can easily think of something like the parable of the four soils where Jesus gives an explanation that is entirely allegorical, as it were — the seed equals the word of God, etc. and the four soils are different responses. So, in that sense, there's nothing new or unique about Paul's use of allegory in Galatians 4. I'd like to suggest, however, that a more helpful term than allegory is the broader term of "figural." That, really, what we see in Jesus' teachings and Paul's teachings there — 1 Corinthians 10 and many other places — represents or shows a certain way of thinking about the world. That under God's providence, all things do connect to each other. Words and trees and actions and events and all kinds of objects in the world do connect because there's one God and Creator over them all. And I think that term, "figural," is more helpful than allegorical because allegorical has such negative connotations for most of us. So, I do think that is, though, in practice what Jesus models and Paul does at key points — the recognition that some things relate to and are figured by other things. There are one or two places in the New Testament where the New Testament writers seem to use the Old Testament in ways which are slightly different to their fellow New Testament writers … Sometimes they'll use perhaps a meaning which is more allegorical, a way of interpreting the Scripture which sees perhaps some slightly bizarre things there. Are they, again, being unfaithful? No. I believe we've been given apostolic examples of a faithful reading of Scripture which can sometimes use these different tools. Sometimes the literal meaning is right, sometimes the Christ-centered one. Yes, sometimes Paul will use an allegory — in Galatians 4 — and that's legitimate. There is an interesting question as whether we are allowed to do the same thing or whether this was something which was supremely the role of the apostles, which they were distinctly able to do. And we should be a bit hesitant in emulating them. But were they being unfaithful in their use of Scripture? Absolutely not. As we look at the complexity of meaning, it's important to remember that the original meaning of Scripture can be different from the applications we draw from Scripture. But, why is it important to distinguish between Scripture itself and our applications of Scripture? It's important that we distinguish between Scripture and our applications of Scripture for several reasons. Have you ever had the experience of having read a passage, being convicted by it, being helped by it, encouraged, corrected — whatever the case might be, God having used it powerfully in your life in a particular area? And then you come back to that and maybe you think that you've exhausted the meaning, as it were, of the value of that passage for yourself. And you come back to it the next year. You're reading through the same passage of Scripture and suddenly it strikes you all over again afresh in a whole different area of your life. I think that those of us who read Scripture through over and over again have had this experience. And one of the things that we need to understand is that Scripture itself is not changing. It's not that the meaning of the text has changed. But what's going on is that we're seeing and we're drawing out of that with the help of God a different way that that meaning. That what he has said is applying to our lives differently this year than it did last year. That former applications is legitimate, the present application is legitimate, but there's an application that's being made. And the next time we're going to come back to it, there might be an application in a different direction that's being made. Or God is continuing to use that text as an instrument to save us and deliver us and mature us into Christ-likeness. The same thing happens — you can go from church to church, and you can hear pastors handling the same passage. And this pastor might bring to bear on his congregation from this same text an application that's rich and that's powerful for his people. You might go the very next week to a different church and find the pastor preaching on the same passage and bringing out a very different application, still consistent with, still driven by and defined by the meaning of the text, but yet rich and full. If we confuse application with meaning, we might come away thinking that meaning is ever shifting, and it's not. Or on the other hand, we might think that meaning is overly narrow. That it only has meaning along this particular line of application and not upon any of the others and think that if this person's application does not match with mine, or this other application that we heard that was very rich for us, that they're wrong, that they're going astray, and they may not be at all. Application is rich and unending. Meaning is fixed. It stays the same. God continues to use his Scripture to do everything that's necessary for our salvation. Most fundamentally, the first step towards being a responsible theologian — and I say this to my students all the time — is recognizing that there is a distinction between what Scripture says and what I assume it means. When we do biblical interpretation, we do it within the context of an interpretive tradition that we've inherited. Nobody reads the Bible in a vacuum. All of us received the Bible from someone else, and we read the Bible within a set of cultural assumptions within a worldview. And so it's important then that just as a personal discipline, really, when we approach Scripture that we do all we can to set aside those assumptions … What we are about as biblical interpreters is allowing Scripture to speak prophetically to us, to challenge our assumptions and to reshape the way we see, not just the Bible, but our world, our lives. So, one of the things that we need to be very careful of in any case is going to the Bible and saying, "Oh yeah, I know what that verse means." Well, we know some things that it means, but there always needs to be an openness for the Spirit to show us something that we hadn't seen before. And I'm firmly convinced that God speaks without contradiction. So, you know, God opening the Bible to us in a new way doesn't mean throwing away what we've already known before. 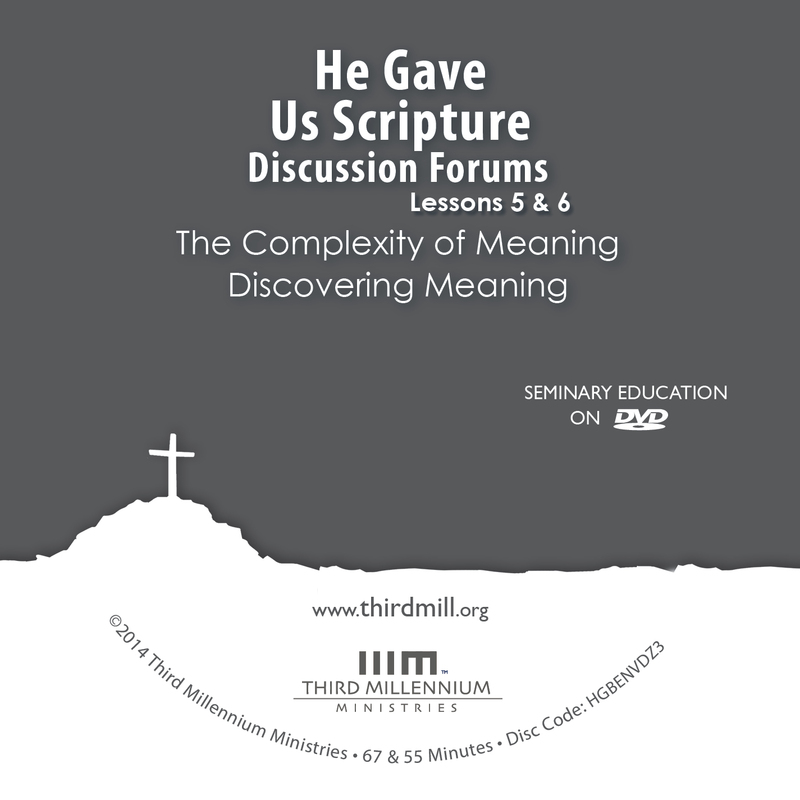 It simply means that we can come to understand the Bible on deeper levels over time through ongoing study. Well, we believe it is important to distinguish between Scripture itself and our applications of Scripture because there is just that extent to which the biblical material that's been given to us is full, and final, and sufficient for every age and every generation. But nevertheless, the writer of the biblical text pointed in the direction of ways in which their material would be understood by an original audience and then understood by a subsequent generation. And to that extent, within the biblical text, there is application that is implied. But nevertheless, they didn't anticipate every context in which the Bible would be read. And so we draw our inferences from the text on the basis of not only how the text might have been understood by the first readers and hearers, but actually how subsequent generations have sought to apply the text in their context. And we see ourselves, as it were, falling in line with a tradition that has helped us understand what the text might mean in previous contexts. And that enables us to see how it applies to today. We need to keep in mind always that Scripture is inspired, and our interpretations and applications are not inspired. And therefore we must be open to continuously review our own applications. Then the situations in which we want to apply Scriptures often change. People come with new questions that they experience. And we need to carefully understand the questions of our time and then apply in such a way that we contextualize the basic meaning of the gospel for every time and age that we are called to minister in. On a number of occasions, New Testament authors quoted or referred to passages from the Old Testament in their instructions to the church. Jesus did this many times as well. This type of teaching can be very beneficial when we attempt to discern the original meaning of an Old Testament passage. For instance, in Matthew 5, Jesus elaborated on the commandment against murder found in Exodus 20. How does Jesus' teaching on the commandment against murder help us better understand God's commandments in Exodus chapter 20? Well, we see in the Ten Commandments in Exodus 20, and also Deuteronomy 5, the sixth commandment which says, "You shall not murder" — two simple words in the Hebrew: "no killing." And often times when we look at the particular commandment, most Christians assume falsely that we are able to obey that commandment perfectly. So, no one wakes up in the morning thinking that they're going to violate the sixth commandment. But when you look at the interpretation that Jesus has in the Sermon on the Mount, he says that it's not just about what we do on the outside … And so he is trying to help the readership to understand, — and the audience — that you commit murder when you harbor bitterness in your heart towards someone, when you hurl insults, when you are unwilling to forgive. And so he's trying to help us to recognize the radical interior significance of the human heart. And who is not guilty of committing those struggles within the heart? And so he's trying to help us understand, it's what happens in the heart that really matters. And so he actually elevates the high standard of the radical demands of the Law. It's not just about something that you do on the outside, but it's actually something that happens on the inside. Jesus refers to the commandment against murder in Matthew 5, and in doing so I think he gives us a fuller sense of what the commandment means. It's in the context of his saying that he came to fulfill the law and the prophets, and I think in doing so, he's teaching us a deeper righteousness than what was being taught in his day by the scribes and the Pharisees. And there he teaches that you might think that the murder commandment, as the scribes and Pharisees would have taught, was predominantly a legal charge, a charge as to whether somebody has committed murder or not. You can physically see whether there's a body and whether they've actually murdered somebody or not. But Jesus instructs us that the commandment against murder in the Ten Commandments refers to our own hearts, so that when we're angry with somebody else — so much so that in our own hearts it's as if we would kill them — that we've actually already infringed on the commandment even though we've not committed any physical act. In fact, on our outside we may look like we're being very pleasant. And I think one of the things Jesus is doing there, not just for the murder commandment but for all the commandments of the Old Testament, is saying, these predominantly speak to not just, when can I be brought before a judge, but when do they refer to my heart. And how can I, in my own life, live these out spiritually and truly before others? The Bible, as a book of revelation, has a capacity, or has the reality, that truths increase as we go along. God adds layer upon layer of revelation. But that does not, in any sense, diminish the power or the truthfulness of prior revelation, but it just shows us that there is more opening up. And we recognize that when we die and we get in heaven, the things that are revealed will have a much clearer meaning to us than they do now. And there will be more revelation then that will be infinite and we'll never exhaust it. So when we look at the Scripture, we need to recognize that it is not just filled with separate propositions that have nothing that can be expanded in our understanding of them. But at the same time, it doesn't mean that they were inadequate when they were given. An example of this, I think, would be the commandment, "thou shalt not kill" and then Jesus' treatment of it in the Sermon on the Mount. [Jesus said,] "You have heard it was said to those of old, 'You shall not murder, and whoever murders will be liable to judgment.' But I say to you that everyone who is angry with his brother will be liable to judgment; whoever insults his brother will be liable to the council; and whoever says 'You fool!' will be liable to the hell of fire" (Matthew 5:21-22, ESV). Well this is clearly a statement in which Jesus is taking the understanding that people have of the commandment, "thou shalt not murder," and is telling them that "you have isolated its meaning; you have not understood the foundation of all the commandments." There is an internal component to every commandment that we must take seriously. Some people when they read the Ten Commandments are tempted to think, "Oh, that's not a commandment I've ever broken." So for example, the commandment says, "Thou shalt not murder," and it's easy to say, "Oh, I've never actually murdered anyone." And then Jesus came along to give what I think is the true, full interpretation of that commandment as it was always intended to be understood. It's not just about the physical act of murder. It's all of the other sins that are in that same category, including simply the sin of hatred in the heart. That's a kind of spiritual murder. And I think Jesus was right to call us out on that and say this commandment isn't just about actually killing somebody; it's about all the murderous attitudes in the heart. And Jesus gives us the full, true interpretation of the commandments of Moses. The Old Testament commands recorded in Exodus 20 are commonly known as the Ten Commandments. But God gave these commands to Moses thousands of years ago. So, how are we to apply them today? For instance, what are some legitimate contemporary applications of the commandment against murder? I think the way to apply the command not to murder is to begin with James, and James begins with Jesus. Jesus says, "You've heard it said, you shall not commit murder … but I tell you the truth, if you hate your brother you've committed murder in your heart." James, I think, takes that interpretation and then applies it to people he's writing to. Because James actually tells the people he's writing to that they're murdering each other. Now, I think it's impossible that James means you're actually committing homicide. Of course that's wrong. I mean, there'd be no question about it. I think James is applying the teaching of Jesus, and when he says, you're murdering each other, I think he's speaking about they're hating one another. And hate is the cause of murder. And so, in a Christian community, hatred is entertaining exactly what the Mosaic law was condemning, and that is murder. But the issue is not just killing, but hating. And so, I think that gives us, then, the key to applying it in contemporary situations. Because anybody can apply the command "You shall not commit murder" by simply not murdering someone. I mean, most of us go our whole lives and that we don't even get close to maybe doing that, probably. On the other hand, we're all, at different points of our lives and in different places, and at different points and towards different people, we all have hatred in our hearts. And I think that's how we have to apply it. And that can be applied across the board, whether it's hatred that we harbor against even our enemies, but hatred that we harbor against people who just simply look different than we do or that we just don't understand. Or hatred that we harbor towards even people that we call brother and sister and see all the time. I think what we have to do is we have to always be remembering, this is really an issue of my heart, and as a member of the new covenant where I'm meant to have, and do have, a new heart, a heart that is given to me so that I can obey God and fulfill his commands. And so, I think that's what we do. We have to apply the principle of hatred to the command, "You shall not commit murder." If I feel angry at someone who I disagree with, or they disagree with me, I need to take that before the Lord and ask him to give me a pure heart and a positive attitude towards people. In debates, I need to have an irenic or a peace-loving attitude towards people… You know, Jesus also said, "Love your enemies," and so how much more should we love our brothers and sisters in the body of Christ even when we strongly disagree with them. What causes fights and quarrels among you? Don't they come from your desires that battle within you? You want something; [you] don't get it. You kill and [you] covet … you cannot have what you want (James 4:1-2). And interpreters recognize James is probably not talking there about literally them killing each other, but the covetousness, the hatred, the exploitation of the rich to the poor — where the rich are denying the poor the ability to have a living, to put bread on their table for their children — is in essence insipient murder. It's denying the very livelihood of that person and their ability to provide for their family. Some legitimate contemporary implications to the biblical command not to murder I think would involve a variety of things. As we all know, Jesus took the Old Testament command to not murder and expanded it broader than most of us would have taken it, so that you can murder somebody by actually taking their character and running it in the mud. So he's very serious about not killing people in a volitional way, that is based upon a sinful grasping for power or trying to abuse somebody else. Now the Bible never says that we're not to kill. And that raises a whole other element of application for just war and for defense and police and having police and armies and those kinds of things. That's not quite our question, but that is a distinction. I think in the modern world, some of the most graphic implications, of course, would have to pertain to the rampant murder of the unborn in the abortion industries around the world. I think there is nothing more horrendous nor necessary for the church to repent and to confront than that slaughter of innocent children. We in the West talk about it, and we may be making some headway in some ways, but it's the millions of dead children stare us in the face, and the church is accountable for our lack of voice there. On the other end of the spectrum, I think there's also an implication that we're going to have to face very soon, and that is the aspect of euthanasia. That murdering people because they're not quite functional enough is a direct confrontation to the image of God created, that God has made all of us in and is unequivocally murder in the sight of God. So, for whatever reasons, even those issues I know that are very painful to talk about, those who are in extreme situations where they have lost all human hope and they live in extreme pain, those kinds of things. Very difficult of course to deal with. But I think there are other answers than ending life, which I consider murder. So, there are a lot of implications. And they're going to get more intense as the days go on. As science and medicine are able to do things with human beings — or not even full human beings — we're going to have to ask our ethicists who are evangelical and biblically based, to give us a lot more guidance in this issue, because it's going to get more and more dark in the days ahead and more difficult to make right decisions. So, a proper biblical statement would be to not take anyone's life in any way, where that person is innocent of a crime or innocent of aggression, causing somebody some kind of physical or bodily pain. Those are issues that I think the church can say we will not go beyond that line; we will not do that, because that is murder in our perspective. There are a lot of issues that a theologian cannot touch on here. This is a very deep issue, but it's an area where the church must continue to talk and have a hard discussion about it because of its radical implications for the ethics in which we live today. The Bible has a lot to say about what God expects of us in regard to our concepts, behaviors, and emotions. But as we seek to apply the Scriptures, we can sometimes overemphasize behavioral application and become legalistic. So, how can we avoid legalism when we emphasize the behavioral implications of Scripture? One of the common errors in the Christian life, as we read the commandments of God and all that, is the error of legalism. And the idea of legalism when it comes to salvation is that I can use my present obedience to God's commands to pay for my past disobedience. And that is completely wrong. We cannot wash away our sins, our past sins, by present obedience, because present obedience is expected and commanded. There is no extra credit for finally obeying the command now. What about the past sins? Well, as the hymn writer put it, "What can wash away my sins? Nothing but the blood of Jesus." Only by the atoning work of Christ can our sins be forgiven. So, that's what I would call "soteriological legalism," legalism related to how we're made right with God. And that's completely wrong and destroyed by the doctrine of justification by faith alone apart from works. But after that, there are other types of legalism. You know, Christians can behave as a community in a legalistic way as they add to the commands of God or go beyond what God wants. And that can be very damaging to fellowship. Groups can require certain things of dress or whatever. I mean, Jesus did tell us if your right hand causes you to sin, cut it off and throw it away. But that's a personal, individual command. For a community to decide, "That is causing you to sin. Give me your right hand so I can cut it off"; that's a community legalism. Like the use of the Internet. Let's say a church decides the Internet has lots of evil things on it. "None of our members can use the Internet." That's an example of community legalism. They're saying that if you do that, then thereby, you'll be saved, but they've instituted some legalistic rules. And it's very important for the elders of a church, the leaders of a church, to be very careful on the one side of legalism in everyday life. But then there's the danger on the other side of license. Because the world is a constant assault on us and we need to have… community holiness. I think every human being is a legalist at heart. We all want to justify ourselves to God by the things that we do. So it's really hard for us in interpreting and applying the Bible to have a strong, grace-centered focus. But it is possible. And the gospel does have implications for the Christian life. And there are things that God commands us to do and things he tells us not to do. The question is, is the motivation for that obedience really coming out of the gospel, out of the death and resurrection of Jesus Christ? And I think you'll find that Christ-centered Bible interpretation that is grounded in the saving work of Jesus Christ puts the commands of Scripture into their proper context. Not as some legalistic thing that you would try to use to justify yourself before God, but simply as a life of grateful obedience for what God has done for you in Jesus Christ. If you're going to put a stress on what behavior Scripture requires, how can you do that in a way that doesn't lead to legalism? The first thing we've got to say is we've got to make up our minds that calling people to do what Scripture calls them to do is not legalism. It is not wrong to ask someone to do what Scripture asks them to do. So, when we start with that basic commitment, now we've got to look at a framework. And the framework is this: any time Scripture emphasizes a behavior to pursue or to avoid, Scripture does that within a framework. And the framework is one of human response to divine provision. And so anytime we talk about a human response, whether it's commanded or prohibited, we've got to ask, what divine provision is it linked with? And we see that pattern throughout Scripture. God commands his people to be fruitful and multiply and fill the earth. But he only asks them to do that after he has already provided for them everything they need for life to flourish. God calls his people to obey the Ten Commandments, but he only does that after he has already delivered them from slavery in Egypt. That's the biblical pattern when we talk about a requirement behaviorally. We're also asking, what has God provided that this requirement is a response to? We're never talking about just one-half of that equation. A couple of other strategies we can do here to make sure that we avoid legalism in applying biblical commandments. One would be, don't mistake a good idea for a divine command. It might be a good idea to wake up every morning at 5:30 and spend fifteen minutes in prayer, but the Bible never commands that you have to wake up at 5:30 and spend fifteen minutes in prayer. It might be a good idea for you. Certainly, the Bible commands that we pray regularly, but it doesn't give all those specifics. We've got to make sure that we don't become legalistic about specifics that the Bible just hasn't commanded. Another thing we do is make sure we address the "why" and the "how" and not just the "what". So, when we come to Scripture, but we're not just asking, what does Scripture require me to do, but we're asking: Why am I required to do that? What is it that's going to motivate me? If Scripture requires me to forgive someone, how does it motivate that forgiveness? By pointing me to the fact that Christ has forgiven me. So, the motive is just as important as the behavior that flows out of that motive. And then the question of "how?" This is a power question. How will a sinner like me find the power to obey this biblical commandment? How will I be changed that much? If I can't answer that question, willpower is only going to get me so far. I've got to know that the power of Christ, the Holy Spirit, is transforming me from the inside out. So, every time I read a biblical command, I want to be asking the question, why am I supposed to do this? What will motive me to do it? And how am I going to find the strength and the power to do this? If we just focus on the "what?" legalism is never very far away. But if we're asking not just the "what" questions but also the bigger framework: How has God provided for me that would give me motive and power to obey him? Now, we're making proper use of his biblical commandments. The meaning of any biblical passage can be multifaceted and complex. This complexity has led some to engage in allegorical interpretation. But even though evangelicals rightly insist on a literal interpretation, we should allow for the fact that biblical authors often elaborated on the original meaning of Scripture in complex ways. If we keep this complexity in mind, we'll be better suited to avoid faulty interpretations and to apply Scripture appropriately. Dr. Andrew Davis is pastor of First Baptist Church in Durham, North Carolina, and Adjunct Professor of Historical Theology at The Southern Baptist Theological Seminary. Dr. Robert K. MacEwen is Department of Chinese Theology Director and Biblical Studies resident faculty member at the East Asia School of Theology in Singapore. Dr. Stephen Um is pastor of Citylife Presbyterian Church in Boston.